It is finally fall, which means time for long and slow braises. This is one of my favorite braising recipes, because it involves relatively little prep work besides a little onion slicing, and results in fall-off-the-bone kind of texture with great flavor. I used Budweiser, but this also works very well with darker ales. I would just avoid anything too sweet. I usually serve this with polenta, and stewed swiss chard with tomatoes and pine nuts. Polenta is a great base because it absorbs the juices, and the swiss chard, well, you need your vitamins. 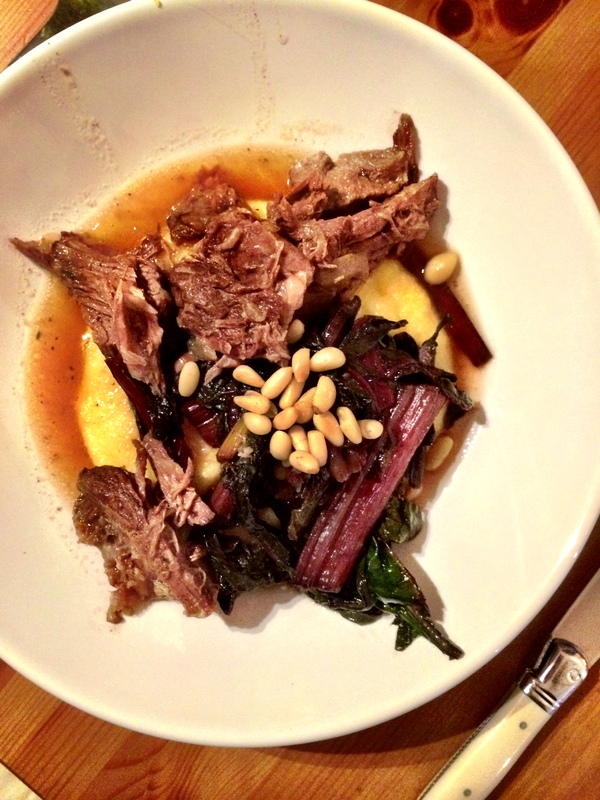 You can make the beef a day ahead, and prepare the polenta and swiss chard right before you serve. Pat the beef dry with paper towels, and season generously with kosher salt and pepper. If you are using a 4-5 lb piece, cut in half. Heat 1 tbsp. of oil in a large dutch oven. When hot, add the beef. Depending on the size of your pot, you may need to do 1 piece at a time. Brown the beef well on all sides over medium heat. This may take 15 – 20 minutes. When browned, remove the beef and add the onions and a splash of the beer. Stir well, scraping up all of the brown bits. Cook the onions over medium heat for 10-15 minutes, until they are softened. If you need to add more beer to continue deglazing, go ahead, in small doses. Add the red wine vinegar, thyme, bay leaves, and honey. 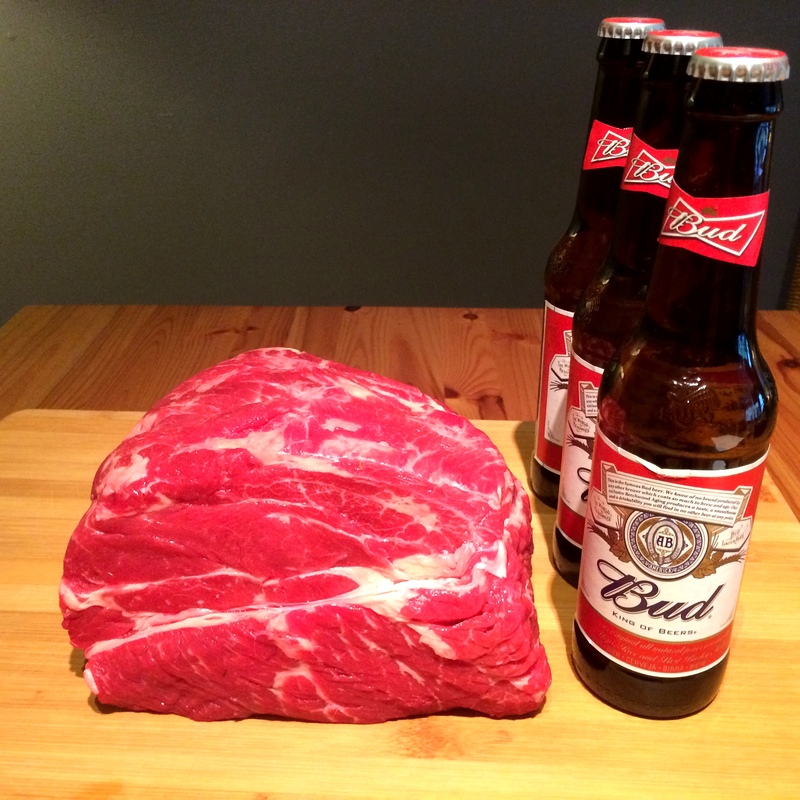 Return the beef and all of the juices to the pot, and add the rest of the beer. Turn heat to high and bring to a boil. Reduce the heat. Cover with a lid, but leave a small opening. 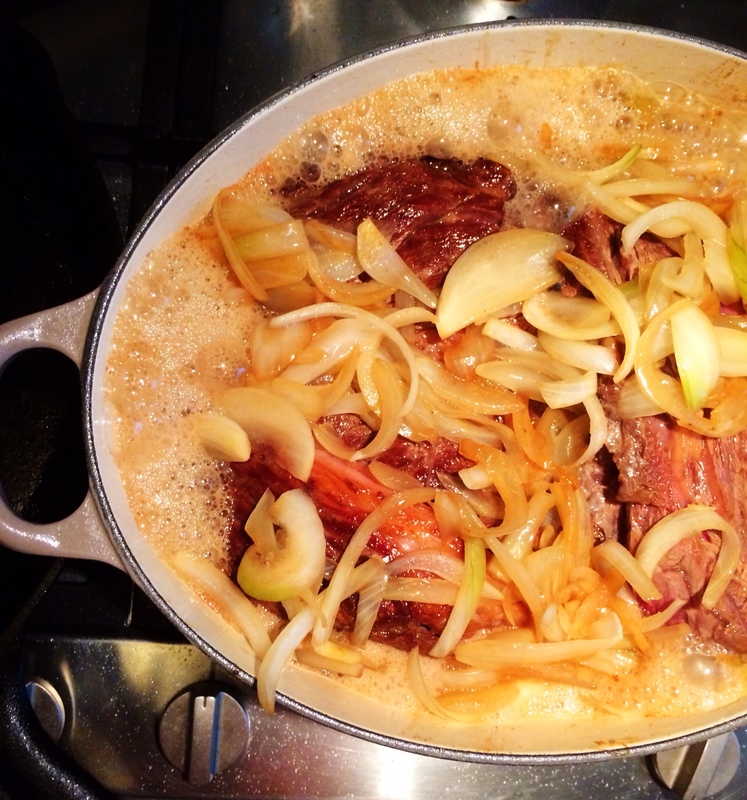 Simmer for 3-4 hours, until the beef falls apart when pricked with a fork. After removing the beef, you can continue to reduce the juices over high heat to use as a sauce over the finished dish. Made this tonight. Came out amazingly well. Thanks for the recipe! Glad you tried it and glad it turned out well! It’s amazing what you can do with just a little beer and beef.